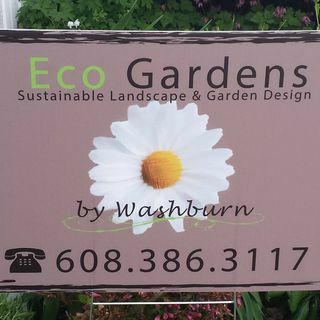 Eco garden by washburn and I've had the opportunity to go through and look at your website and your Facebook stuff and I think it's really cool that you have the software you have the ability to help somebody actually plan their yard using 3-D landscape design. big screen TV or just glance at it on the computer. I always finish a flash drive so that the client can do this or that. No you'd mentioned a couple of different things like backyard patios and decks and fish and ponds and things like that is that all stuff that eco gardens does. I do small paper patios I do very small retaining wall feet walls nothing taller than three feet high and usually not more than 100 feet long. Now the ponds do not do so I leave that up to the professionals when it comes to the other gardens we've talked about. We've talked about planting gardens and stuff but I know in the past we've had conversation about different types of gardens like pollinator gardens and rain gardens and rock gardens. Is there anything special you need to do to those types of gardens as we turn to the next season leaving your plants and to the spring to benefit the pollinators. You could give it a really good reading if you know like a rock garden. What I'm kind of thinking is it's hard to leave if you have a lot of leaves that fall onto your garden and then sit and decompose there. What I mean that's turning into organic matter and with organic matter we get growth. So it's a weed seed goes into the organic matter in between a rock that more than likely lead to plants that you don't want there otherwise known as a weed. If you can blow those leaves out or pick them out. But that would be the best thing you can do going into winter for a bit like a rock garden. But your other garden I would invite the leaves fall in their.